Between the years of 1942 and 1944 around fifteen thousand blacks and fifty thousand whites were recruited to the Manhattan/ Hanford Project in Richland, Washington. The federal government required government contractor, DuPont, to keep the number of black construction workers on the project between 10 percent and 20 percent of the total workforce. The 20 percent limit was imposed because the federal government believed white workers would protest if black employees accounted for a larger percentage. 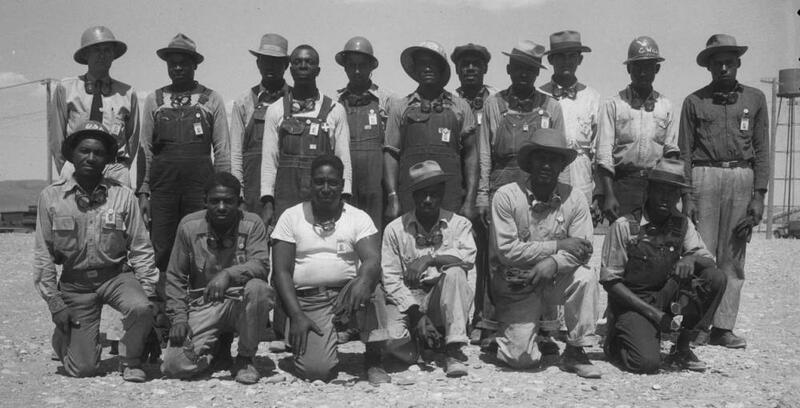 Black worker participation in this project in the Pacific Northwest was driven by both President Franklin Roosevelt’s Executive Order 8802, issued on June 25, 1941, which prohibited racial discrimination in employment by any private firms that received federal contracts and more generally by the wartime labor shortage. Regardless of the reason for the recruitment of black workers, they, along with other DuPont construction workers, provided the essential labor for building the facilities in which the plutonium for the first atomic bombs was produced. Many of the African Americans who had migrated to the Tri-Cities (Richland, Kennewick, and Pasco, Washington) from the South sought better jobs but also believed their social status would improve in the Pacific Northwest. Many whites from the South assumed the status of blacks in the Tri-Cities would be similar to their former homes. Although all of the workers recruited to the Hanford Project knew they would be well paid and that they were doing important work for the war effort, none knew the facilities they were building would be used to develop the first atomic bombs. The Hanford Area was a large desert reservation northwest of Richland that was used to build reactors and chemical processing plants that produced the plutonium used in the atomic bomb dropped on Nagasaki, Japan. The mystery of their work was solved on August 6, 1945, when the bomb was dropped. Over the years of the project, the black workers at Hanford lived in segregated barracks on the Hanford Reservation or they were confined to a segregated area of East Pasco. The black population of Pasco in 1940 was twenty-seven. By 1950, approximately one thousand African Americans lived there. Kennewick kept black residents out through racially restrictive housing covenants while Richland remained all-white by providing housing only for scientists and professional staff at the facility. The Hanford Site housed some of the black construction workers in the “colored” barracks, but the mess halls and sports teams were integrated. Despite housing segregation, blacks and whites received equal pay for equal work. Black workers were, however, more likely to hold unskilled jobs at Hanford. Black women were restricted to DuPont employment as cooks or waitresses, although a few found jobs as maids in private residences. By late 1944, most Hanford construction had been completed, and the majority of African American workers moved to cities in the region or away from the Pacific Northwest. About one thousand black workers and their families remained in East Pasco after 1945, forming the nucleus for the African American community in the Tri-Cities region today. Annette Cary, “Exhibit chronicles hard life for blacks at WWII Hanford,” Tri-City Herald (Feb 2016); Annette Cary, “Segregation has been a hard habit to break in Tri-Cities,” Tri-City Herald (March 2007); Annette Cary, “Black pioneers of early Hanford honored,” Tri-City Herald (Feb 2005); Annette Cary, “Segregated Labor,” Tri-City Herald (Feb 2002); Charles Mudede, “Black Americans Came to Washington State from Around the Country to Help Build the Atomic Bomb,” The Stranger (Dec 2015), “African Americans and the Manhattan Project,” http://www.atomicheritage.org/history/african-americans-and-manhattan-project.